Sleeping Dogs is a game that almost did not come to fruition. Originally to be published by Activision under their ‘True Crime” series, Activision decided to pull the plug on the title as they did not believe it was capable of competing in the open-world action game market (read: Grand Theft Auto IV). Fortunately Square Enix picked up the the rights to the game and, with the help of developer United Front Games, re-tooled it to try to reach and exceed the high standards set by GTA4. In this review I will discuss the story, gameplay, and performance numbers achieved with my AMD HD 7970. In Sleeping Dogs you play as an undercover cop, Wei Shen, who is assigned to infiltrate and bring down a Hong Kong triad group called the Sun On Yee. After joining the gang, Wei is ordered by his police commander to continue earning the respect of the Sun On Yee and work his way up the ladder to bring them down. Shen must balance his assignments from both parties, while doing his best to fit in with the triad and maintain relationships with friends and colleagues on both sides of the law. As the story progresses, the once-clear lines of right and wrong become blurred, leading to trust issues and altercations from both factions. Even though the story is somewhat predictable in the way the plot carries out, the solid voice acting, gameplay, and writing kept me interested throughout the entirety of the 25 mission (10ish-hour) main storyline. Alongside the campaign there are numerous side-missions and collectable items available to help Wei become more powerful. For example, there are hidden statues placed throughout the world and if you return these to your martial arts master he will teach you a new melee ability/combo for fighting the variety of enemies. There are also drug busts, car thievery, dates with lady friends, car races, and even karaoke to name a few of the other things to do throughout the game – each activity will help by giving more experience/respect for each faction and money to help Wei buy clothes, food, and cars. While most of the side-jobs were entertaining the first few times that I did them, the actions started to become repetitive which led to me pushing through with the main story. In my gaming experience, I’ve found that I prefer the mini-games and side-jobs be fun but fleeting because it keeps me moving forward in the main storyline. In some games (Elder Scrolls and Fallout for example), I get sidetracked because there is too much world to explore and too many things to do; I end up so separated from the main storyline that I lose interest and move on to another title. Unlike the Grand Theft Auto series, Sleeping Dogs takes a large focus on hand-to-hand combat throughout the majority of the game. As Wei Shen continues to gain trust (reputation experience points) with the Police department, the triad, or the general population via main-story missions or side quests, he earns choices of new, more powerful actions to perform (generally the police abilities focus on weapons and the triad abilities focus on melee). The game does a good job of pacing the experience-gain versus the types of enemies you will be facing (the sorts of weapons or attack styles get increasingly more difficult as you progress). Unfortunately, when the story quite suddenly progresses from no one having guns to guns being the weapon of choice, the action gets a lot less interesting and sometimes annoying. The aiming did not feel as accurate as it could be, as even from medium range I found myself missing more than I would in other games. When everyone is fighting hand-to-hand, the combat is focused more on timing and countering the opponent(s) [e.g. Assassins Creed or Batman: Arkham Asylum]. After guns are introduced, fighting turns into more of a cover-based shooter that just is not quite on par with the competition; fortunately, there are ways to slow down time when diving over cover and zooming-in while driving that allows for some fun slow-motion kills and action sequences like you would see in Max Payne or a movie. I played the game with a wired Xbox 360 controller on my PC and found that it was better for driving, fighting (hand-to-hand), and running around compared to some quick testing with a keyboard and mouse combination. The graphical quality of Sleeping Dogs is impressive, especially for an open-world game. The cut-scenes look relatively realistic and the city itself feels alive and real. There were the occasional pop-in textures that is common among games of the genre, and a couple visual clipping issues that are not unusual (and appear to have been fixed with updated drivers and patches). The game literally shines when the rain starts falling in the city and the roads begin to look a bit slick. Below are some pictures that I took from the in-game benchmark, including from cut-scenes, fighting, and exploration of the city. For the performance test I used the built-in benchmark inside the game after changing the graphical settings to each of the presets. I then recorded the reported minimum, maximum, and average frames per second (FPS). After running through the presets I played with a few of the settings under the extreme (highest) preset to see if I could squeeze out some more FPS with minimal drop in image quality. As you can see above, the game stays very playable with the HD 7970 even with extreme settings at 1920×1200, although the dips below 30FPS can be noticed when there is a lot of action going on in the game. 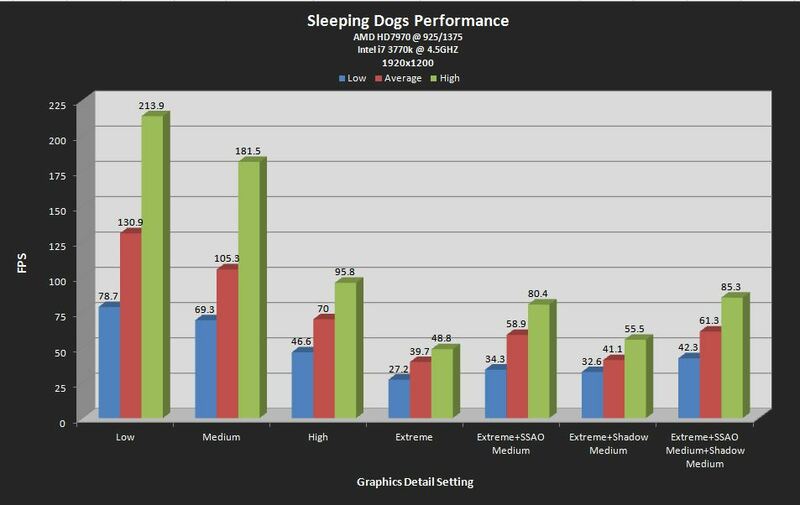 In order to save some FPS, I customized the detail settings and re-ran the benchmark: By turning down the SSAO setting from high to medium it increased my FPS by 19.2 (almost 50%); changing just the shadow setting from high to medium gave a comparatively small, but noticeable increase of 1.4 FPS (about 4%). Turning both settings down gave an almost additive FPS increase of the two together (21.6 FPS, an overall increase of about 54%). Changing these settings made little difference with the game visuals but allowed the game to play at significantly higher FPS. Below is a collection of screenshots from the in-game benchmark at the various graphical settings (Low/Medium/High/Extreme). The images were taken at 2560*1440 resolution using MSI Afterburner and were scaled down for the site. Click on one of the images in the column to see a slide-show gallery of the images. Overall, Sleeping Dogs provides a very fun open-world gameplay experience for the 10+ hour campaign (with additional time for side missions). In addition, since launch there have been 5 DLC packs to come out if you find yourself looking to extend your stay in Hong Kong. 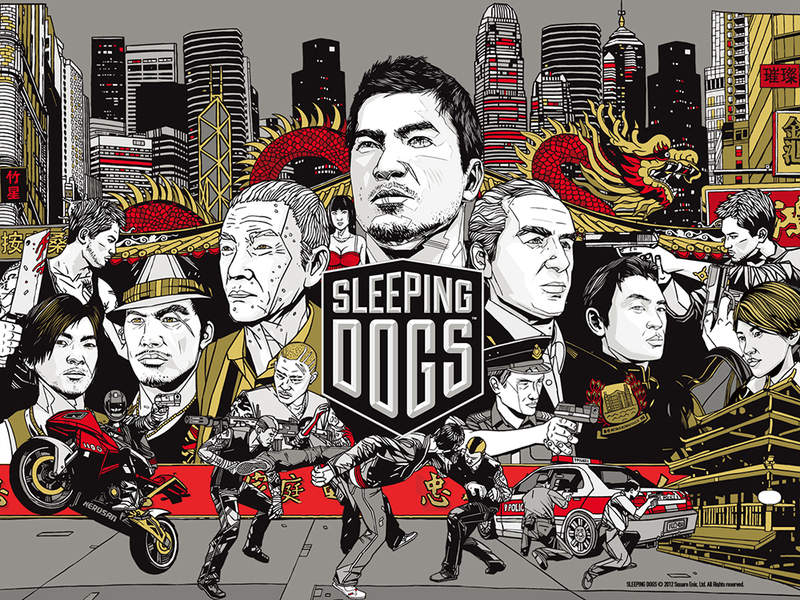 If you are a fan of the genre and have not yet played through this game, or are biding your time until September for GTA5, I would highly recommend picking up a copy of Sleeping Dogs. The game is available on Steam for $25 but has been part of multiple sales bringing the price as low as $10, making it a great value. Special thanks goes out to AMD for providing me with the game code for review! YEEESSSSSSSSS !!! more game review please!!! 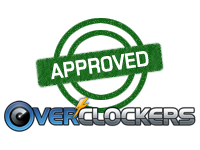 this forum will get SOOOOO much more people reading cause many people dig these reviews!!!! this is what people that plays the games wants to know! Thanks for the feedback! I'll be sure to take that into consideration on my next one. The only issue with the card benchmarks is that I don't have many cards at all so my numbers wouldn't be able to give any sort of complete idea unfortunately. This one is on my, to play list. Sounds like I should get on it! just under $20 for the game and the entire dlc collection minus the high res texture pack that is over 4 GB alone. On sale this weekend on Steam for $6.24! I'll give it a shot for 6 bucks, thanks for the heads up. I got another 2 players noted for the summer sale and they jumped in too!